Where can you get a fresh cut, shampoo, head and hand massage, and serene atmosphere? Studio B Hair Gallery. 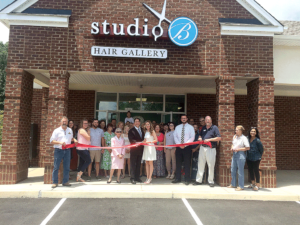 The Chester Business Association welcomed Studio B to the community last week with a ribbon cutting ceremony held at the new salon off Iron Bridge Road at 12128 Branders Creek Drive. Pictured above are Bethany Young Yurachek (center) with her husband Val. Also in attendance were the following association members Sean Eichert, Plus Management; Elliott Fausz, Citizens Bank & Trust; Mike Keene, WoodCraft Signs; Jerome Weedon, Rite-Aid; Ward Shelton, Citizens Bank & Trust; Tammy Ridout, Chesterfield County Fair; Jan Rusbasan, Chesterfield County Fair; and Wendy Hughes, Chesterfield Clerk of the Circuit Court. Yurachek recognized and thanked her family, friends, and clients, who helped her achieve the dream of owning her own salon.